More than two weeks ago I received an sms from my friend Monica, who was on the North side of Everest, saying: “Billi, the earth is shaking and I have a feeling that it is really bad in Nepal.” I immediately went on the net and information about the devastating earthquake was slowly tricklingÂ in. I tried to ring my flatmates Sam and Richard, but of course the networks were down and I could not reach them. I knew that Richard was on a running raceÂ in Mustang but I had no idea where Sam was at the time. I sent Whatsapp messages and sms and tried to call, but no answer.Â It was driving me crazy. I felt completely helpless and bemused as this was the very first time in 11 years that I was not in Nepal – either in Kathmandu or on an expeditionÂ – during that time of year. I finally got through to Miss Elizabeth Hawley, who seemed to take the earthquake with great calmness. “I am sitting at the very table I was sitting when the earth was shaking in 1960,” she told me when I asked her how she was. When I advisedÂ her to maybe crawl underneath the table, she barked: “There is no space as my staff is underneath the table. And if I go there I will never get out again! Don’t worry about me, my house is safe,” she concluded. After a while I was able to speak to Sam who was on her way back to Kathmandu from Chitwan in the southwest, where she was sitting onÂ a bus during the quake. “It feltÂ very strange. The bus we were travelling inÂ was rocking but we were not moving.” At that time, neither of us knew whether our house was still standing or how big the extent of the earthquake was. I was unable to leave my computer and the phone all day and slowly but surely I was able to reach more people as the phone networks miraculously started to workÂ again. Many people seemed fine, which made me feel relieved, however, the helplessness did not fade. On one hand I was glad that I did not have to experience the quake; on the other hand I was desperate to go back: But how? Was there a point in bringing my flight forward and go back immediately? What could I do? Of what use would I be? The question was solved when I received a phone call from the Swiss Humanitarian Aid, who I am a member of, at 8pm on Saturday asking me whether I could be in Bern at 5.30am the next day to fly back to Nepal with a Rapid Response Team. Of course I could! However, going back meant that I could not do what I came back to EuropeÂ for: attending and being a bridesmaid at my very good friend Chrissie’s wedding. I had really been looking forward to it and being with her on her special day was important to me. It was so important that I did not plan an expedition for this springÂ and chose to come back and be with her and Tom, her husband-to-be. I spoke to Chrissie who was initially very disappointed but of course completelyÂ understood my urge to go back to lend a small hand to the country, I love so much: “Billi, we met in Nepal and the country is very dear to both of us. Go to Nepal and go for all of us,” she told me. And so I left. Our team of six people landed at Kathmandu Tribuvhan Airport at 11pm and it took about two hours for our small REGA plane to get a parking space on the tarmac as dozens of flights had comeÂ in and the airport could no longer cope with such an influx of planes. It was raining and it was cold, which is rather unusual for this time of year as we normally bask in the heat at the end of April. The floors of the airport showed some serious cracks and there the lobby was full of people, mostly tourists, supposedly trying to fleeÂ the devastated country. When we stepped out of the airport, the atmosphere was eerie and I had never experienced something like this before. There were hundreds of people wrapped up in blankets or plastic sheets inÂ front of the airport either milling about or lying in the open air trying to get some sleep. The strange thing about this scene was that it was extremely quiet – it felt like a ghost town. “Is this normal?” Olivier, our doctor who had never been to Nepal before, asked me. “No, people usually stay in their houses to sleep,” was my answer. On our way to the Swiss embassy, where we were to be camped and set up our office in the outdoors, the roads were eerily quietÂ but there were people everywhere and it was clear that everyone was scared to go back to their houses and opted to sleep outside – despite the cold. 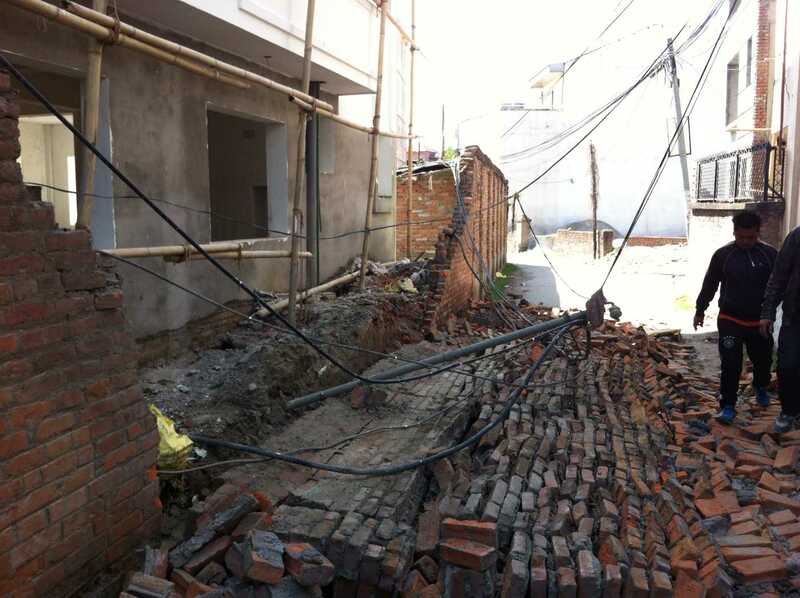 The earth was still shaking and up until now the aftershocks have not stopped: apparently there have been around 100 aftershocks since the earthquake happened on 25th April. When we arrived at the embassy at about 1am I was surprised to see a few big tents in the garden: these were set up for Swiss tourists, who had sought refuge in the safe surroundings of the embassy. And this is exactly where and when our work started. 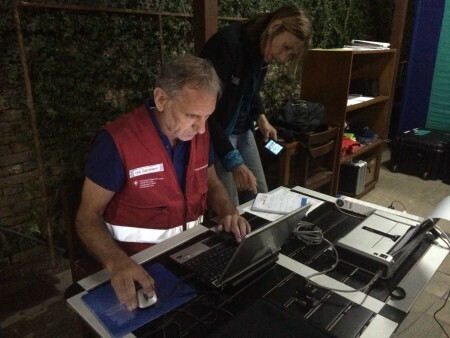 Our team of six was the first batch of a biggerÂ Swiss Rapid Response Team and our job was findingÂ out where the needs are, getting the distribution of relief items started and setting upÂ an infrastructure. As I knew Nepal and many people there (and at this point I would like to thank my friend Dinesh, Carolyn, Richard, Sam, Helen, Roland and many others) , my job was to organise and facilitate the work of my colleagues, who came here asÂ water experts, shelter experts, architects and medics going to the affected areas to findÂ out what the needs were. On Monday morning, I managed to quickly grab a cab and go home to get my bicycle, some warm clothes (it was still cold) and to see Sam and our house. Sam and her partner MichaelÂ had just come home with a big 20l container of water and they were happy to haveÂ found it. “They are starting to ration the water,” Sam said giving me a warm welcome hug. It was nice to see that our house was relatively unaffected and apart from a collapsed water tank on the roof and items scattered around my room there was little evidence of the quake in our home. When I got on my bike to cycle back to the ‘office’, which was a table and a chair underneath a small tin roof at the embassy, I did not see that much destruction and I thought to myself that the pictures of Kathmandu we see on TV wasÂ very different from what I saw on my bike ride. Most houses were still standing, however, I noticed that many of them were cracked and it will be interesting to see whether these cracks are structural andÂ whether the buildings can be used in the future. I was surprised though that the big new buildings I thought would collapse during a quake were still up, however, most of the beautiful old brick buildings had just crumbled under the jolt. Sadly,Â Kathmandu Valley has lost a lot of its history with the UNESCO World Heritage Sites ofÂ Bhaktapur and Patan badly destroyed. 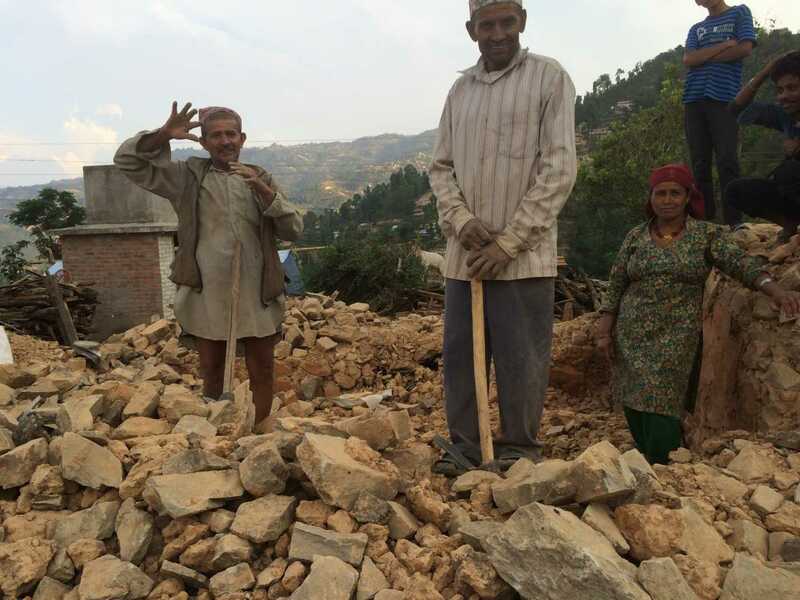 And of course, most of the destruction happened in the remote villages where either the quake made the houses crumble or huge landslides just buried whole settlements. 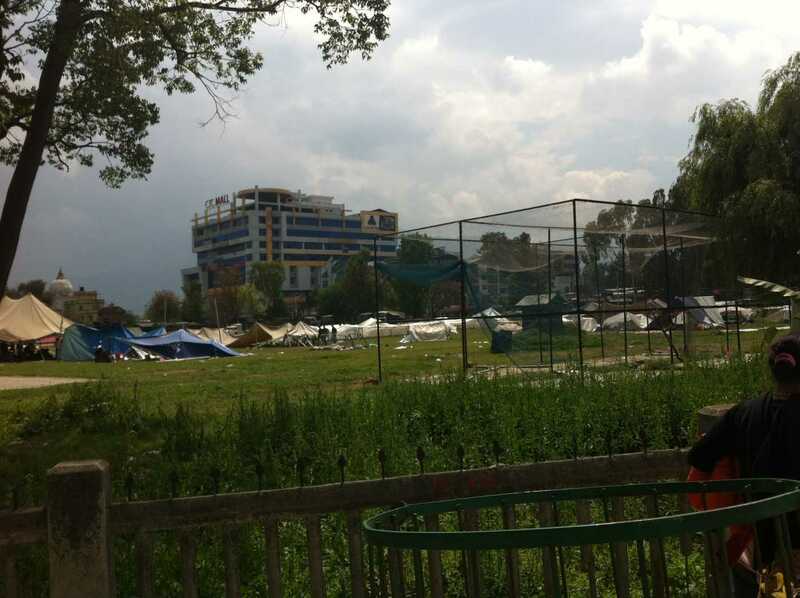 When I reached Ratna Park I noticed that a very significant part of the skyline was missing: Dharahara Tower, a nine-storey 60m-high tower, which was built in 1832 had collapsed during the earthquake burying 180 people underneath it. During the first few days, which did not leave me time to do anything but work, eat and sleep in the tent of the embassy, I was simplyÂ functioning and did not feel like ‘Billi’. I did not have time to respond to emails, phone calls or requests from people wanting to find out whereÂ they should donate money to (suggestions see below). 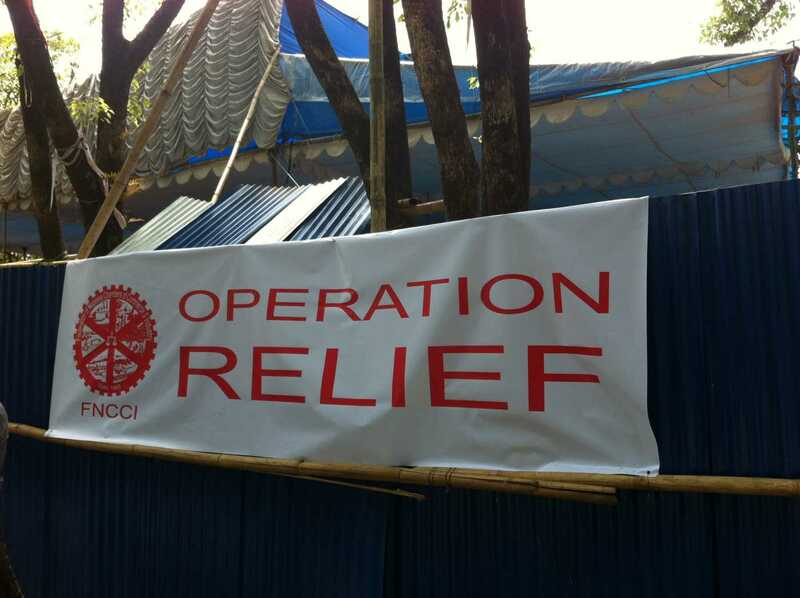 I was like a robot trying to help organise the distribution of our relief items, which did not prove easy. It became evident very quickly that access was a major problem and that we were only just beginning to understand the extent of the devastation.Â I guess that many aid organisations want to follow their usual strategy ofÂ thinking big by distributing thousands of tarpaulins, kitchen sets, food and everything else that is needed in a big truck or on a plane to one place. However, this strategy is not really possible in Nepal. We cannot think big inÂ this mountainous country as Nepal is craggy and rugged with hundreds of tiny villages beingÂ scattered across many hilltops. So the main question is how to reach them? After our organisation hadÂ received thousands of much-needed tarpaulins, it proved almost impossible to find a helicopter to distribute these itemsÂ from the hub, the United Nations World Food Programme (WFP) had set up near the town of Gorkha, which is in an area that was heavily affected. 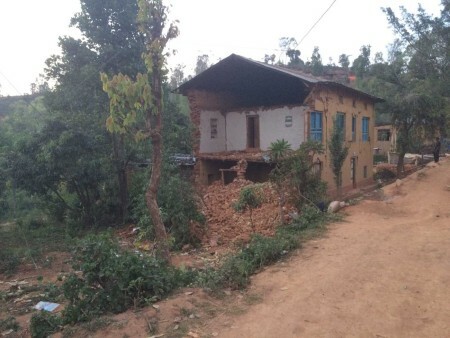 However, Nepal being a country where goods – no matter how big or small – are traditionally carried, the plastic sheets and kitchen sets were quickly put on a van and distributed by porter to the affected villages north of Gorkha, which at least was a start. And just as the Swiss, there are now hundreds of aid agencies, governmental organisations, UN agencies and private people struggling to bring aidÂ to Nepal, which is not an easy job due to some government regulations, Nepal’s geographic challenges or the unseasonal weather, which apparently has brought more rain since I left two days ago. And even though the United Nations said in its reports that aid workers had now reached all affected areas, I can not quite believe it as every day I hear aboutÂ yet another village or area that was affected or destroyed. Communications to the tucked away settlementsÂ is still difficult and unless someone can go there to check it out, it is very difficult to know what else has been destroyed. Just writing this I am realising that I could go on and on and on, but I guess it is like the needs in Nepal: they go on and on and on and they seem endless. I could carry on telling you that my heart sank when I saw aerial pictures of the completely destroyed Langtang village in the popular Langtang trekking area; I could continue lamenting about the frustrations trying to helpÂ people and knowing that whatever we do is only a tiny little drop in the ocean. However, there is one thing we must not forget: it doesn’t matter how small the drop is, Nepal can hopefully fill this ocean again and with the resilience of itsÂ people, who are used to a tough life, the country can be built up again. I will stop here as myÂ head is still spinning from all the impressions fromÂ Nepal but before I go I would like to say a big Thank You to everyone whoÂ was thinking about me and sending me encouraging messages, and I would like to apologiseÂ for not havingÂ time to respond immediately. And I would like to thankÂ everyone for keeping Nepal in their thoughts. There has been amazing support from the outside world and there is a lot of aid pouring into Nepal now, which is wonderful as people need immediate relief. 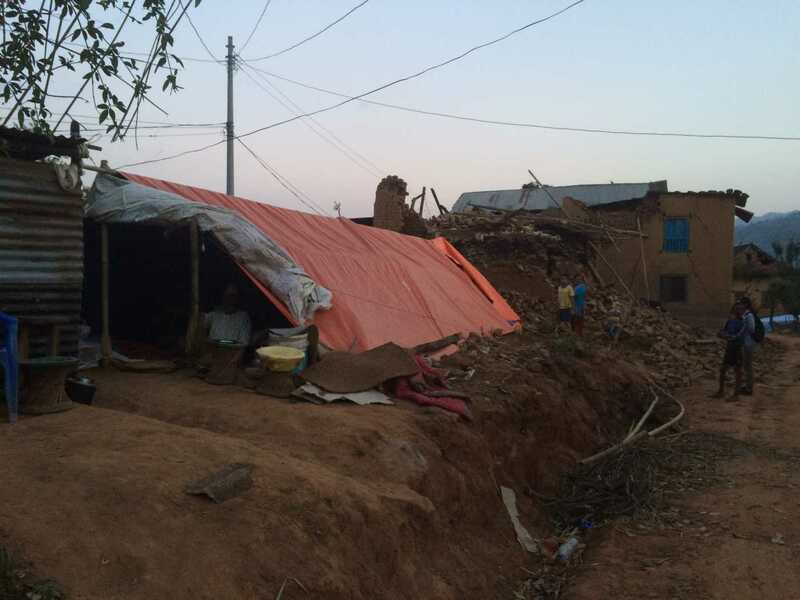 They need tarpaulins to find shelter from the rain and with the monsoon being at the doorstep they will soon need something more solid, for example corrugated iron sheets. But in all this immediate relief, we mustÂ not forget that Nepal will need a long time to rebuild itself andÂ I am worried that theÂ Himalayan nation mightÂ be forgotten in a few weeks. It is already out of the media, which was omnipresent in Kathmandu for the first three days of the crisis and then quickly disappeared. For this reason, I beg all those, who wantÂ to donateÂ money to bear in mind thatÂ Nepal will still need help in three-month-time and beyond. Another great couple I know is Andrea Zimmermann from Switzerland and her boyfriend Norbu Sherpa from the Kanchenjunga region. The couple is currently distributing relief items to the badly hit Sindhupalchowk district east of Kathmandu. If you want to read about their work and/orÂ support them, click here. Last but not least, I have come across PHASE, a UK-based organisation, whose team has worked tirelessly to get support to the people in the remote villages of the Himalaya. After long discussions with Helen and Roland and going to the Kathmandu distribution centre myself, I believe that PHASE is doing a great job atÂ getting aid to the people, who are so much in need. PHASE is also supported by the Himalayan Development Foundation – an Australian organisation I happen to be an ambassador of. And of course, other than financially support these organisations, whichÂ areÂ working extremely hard toÂ sendÂ immediate relief to the people in need, it is essential to getÂ tourism back to Nepal in the long run. Probably not now as the country needs time to heal and has not got much resources to absorb more people at the moment, but later. So I urge you: please do NOT cross the trekking tour in Nepal off your bucket list. Nepal will need you in the long run! Let’s all try and work together to help Nepal get out of this. Keep up the good work Billi and stay safe. I got a lot of donations from my friends last night and sent it on to Fani today for tents, blankets and food. It is so terrible what has happened to beautiful Nepal and its lovely people. Billi, it feels to me like someone just hit the replay button 🙁 But this time I am not in Kathmandu! Going to try my best to get some funds raised in South Africa while I am here for the next 2 weeks. Still debating whether or not it makes sense for me to go via Kathmandu to London, simply to get some cash into the country and also to check up on the Ruby Valley project. So hard to know what the best thing to do in the situation is. I am sure you are dealing with all the same questions. Please keep us updated with your plans. Loads of love and thank you again for sharing your story, which is also our story, in your blog. Oh Billi, thank you so very much for your very compassional and hearfelt words in describing what you have seen in Nepal. It is a relief to know that you are safe and as usual are doing everything you can to help the wonderful and caring people of Nepal. I have been in touch with Roland and donated to his fundraising and I hope that relief and help is now getting to the remote regions where they desperately need help. Everyone most definitely should not cross of Nepal from their bucket list – I for one am now determined to come back next year for a trek. Stay well my friend and thank you again for writing to us and letting us know what is happening. My dearest Billi, thanks for all of you great jobs there…We don’t leave or Nepali friends alone, we need them and their amazing country also!